I had my delivery in the Apollo Cradle. Under the supervision of Dr Vishakha Munjal, the whole process went smoothly. The whole team is pretty efficient and caring and made sure that my new job of being a Mommy was less painful. I am thankful to the entire staff. You will always be part of that treasured memory. I got my baby delivered in the Apollo Cradle. My doctor, Dr Vishakha Munjal was very supportive and made me feel comfortable during the entire process. The doctors, as well as, the nurses were very attentive during the entire process. I am thankful to the entire team of Apollo Cradle and would recommend it to all my friends and family. Dr Vishakha Munjal was an angel to us. She was so supportive and made us understand the whole process thoroughly. The staff of Apollo Cradle is the best, they tried their level best to make us feel at home. My care manager is the sweetest lady ever and was very attentive. I would surely recommend Apollo Cradle to anyone looking for a quality healthcare. I am glad that I picked Apollo Cradle for my delivery as I received the most amazing treatment here. Everything here is worth being praised. 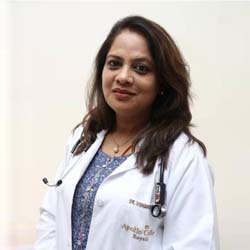 Dr Vishakha Munjal is very experienced and learned. They addressed all my queries with patience and efficiency. The staff was highly cooperative and responsive. I am thankful to the Apollo Family for giving me a homelike treatment. Apollo Cradle was recommended to me by my friends and I am glad that they recommended me this hospital. I had a really comfortable time here. I faced no inconvenience as such. The staff is good and serves you with great respect. All the concerns and queries I had were addressed by Dr Vishakha Munjal very efficiently. I am happy with the kind of love and care I received here. Thanks, Apollo Cradle. During the course of my stay here, I found the services and facilities provided by Apollo Cradle to be par excellence. I have been to hospitals before, but never received the kind of treatment I received here. Everybody here is hospitable and treat you with respect and great empathy, especially Dr Vishakha. The rooms and washrooms are well-equipped with basic amenities and are squeaky clean at all times. I would surely recommend it.